It’s that time of year again…to jump ahead and start your spring cleaning! Many of us have our routines for Spring – from washing windows to moving furniture to reaching every nook and cranny to remove all of the dust and cob webs from the winter months! Often times, we forget one of the most brilliant features of our homes – our lighting fixtures, specifically our chandeliers. While there are companies that will clean your windows and lighting throughout your home, Executive Chandelier Services LLC, located in Pittsburgh, PA, specializes in the delicate work required to properly clean your chandelier. Their premier white-glove service will have your chandelier become the stunning centerpiece of your home, as it was meant to be. With more than20 years of experience in cleaning, installing and restoring all types of lighting in the Pittsburgh area, founding owners Jeff and PJ provide the Dos and Don’ts of Chandelier Cleaning. Inspect the Chandelier: Prior to disassembling, make sure there are no broken pieces or loose wires. Assess the need for replacement bulbs. And most importantly, diagram or mark where all of the removable pieces belong. Once disassembled, it will be extremely difficult to bring your chandelier back to its stunning brilliance without instruction on proper placement of prisms and pendants. Turn off the Lights: After checking the bulbs, be sure to turn off the lights and electricity to those outlets on which you are working. Any time you are working with electrical items, you must practice safety first. Use Padding under Work Area: Always place a thick comforter or mover’s pad under the chandelier before you start working. This will not only protect the surface below the chandelier, but will prevent breakage from any crystals that may fall during assembly or disassembly. Always Clean by Hand: Using a mild detergent, gently wash all of the removed crystal pieces in lukewarm water, followed by a clean water rinse. Carefully, dry each piece with a soft microfiber towel. Gently wipe the chandelier’s frame, arms, light bulbs and any other non-crystal parts. Clean Once per Year: It is highly recommended by most crystal chandelier manufacturers to clean your chandelier at least once a year. Consider Hiring Professionals: Professional chandelier cleaning services specialize in this delicate and meticulous work. Plus, they have access to the tools needed to get the job done. Never Use Sprays: Never spray solutions directly onto a chandelier. It can ruin the frame and cause corrosion. Never Use Harsh Cleansers: The use of harsh soaps, chemical-based cleaners, ammonia-based products or citrus orange cleaners can damage the many delicate pieces of the chandelier. Avoid Direct Sunlight: Cool and cloudy days are the best for cleaning your chandelier. Avoid cleaning your light fixture in direct sunlight, as the heat dries it too quickly. Turn or Twist the Chandelier: Never turn, spin or twist your chandelier as you clean it. Not only will your diagram be difficult to follow when replacing the pendants and prisms, but you will cause wear and tear on the connection to the ceiling. Executive Cleaning Services, Inc. takes great pride in meticulously handling, cleaning and restoring your investment, no matter how large or small the job. 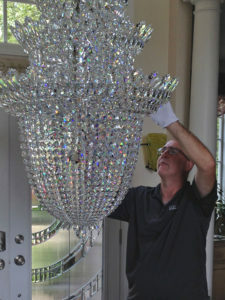 Executive Chandelier’s highly skilled and reliable service begins and ends with founding owners Jeff and PJ. Jeff brings more than 20 years of experience in cleaning, installing and restoring all types of lighting in the Pittsburgh area. PJ combines a craftsman’s touch with two decades of business and sales knowledge to ensure you are satisfied with your Executive Chandelier experience. For a free estimate, call 412-487-9219. The quality of work is exceptional — and the results are extraordinary.